Gourmet Townie: Ways to move. Or not. Well would you looky here. This is me. Dressed! In something other than what I can scrape off the floor. For the last 2 weeks we have been moving out of our house and then back into it. What? I know. Read on. We stayed at Mum's for two weeks during the whole pallaver. Two toddlers, a sleepless baby, three cots, two adults (Mum was away), three cases of croup, two cases of gastro (one of them mine) and a house move (multiple, really). Man, it was hell. And somewhere along the way I packed clothes for all the kids and none for me. Except a large suitcase full of scarves. Huh? I'm pretty sure moving from a four bedroom home to a five bedroom home with a pool is right up there on the list of first world problems, but indulge me a little. In October we put our first home on the market, which of course involved a lot of boxing and decluttering. I LOVED the minimalist existence we created for ourselves to be honest - so easy to keep clean and tidy and organized - and it paid off with a quick sale. In December, now eight months pregnant, we moved most of our belongings into storage and bunkered down with Sam's parents for what was to become to craziest phase of our lives to date. In January, baby Audrey came along and three under two-and-a-half got real. SO grateful for the in-laws' extra hands (and for Mum just down the road). I lost count of the number of times Sam and I looked at each other in terror as we realised we were in well over our heads. July saw the in-laws' downsizer reno nearly complete and planning for operation move began. We temporarily moved to Mum's on a Tuesday. The in-laws moved out permanently on the Friday after which the carpets were sprayed for carpet beetle. Have you heard of it? A nasty little critter that eats carpets and woollen jumpers. I know, right! These guys were the reason we moved to Mum's. Carpets were cleaned the following Tuesday, our furniture and stored possessions came in on Wednesday and we had our first night together here on Saturday. Cue flowers and bubbles from my mother-in-law (and a bell to summon the children). So what is that? A three day move? Or 11 days? Or maybe eight months. When considering "ways to move" this is probably NOT one to recommend. But is there any way to move easily? Like so much in life, everyone's circumstance is unique and demands it's own strategy. With it's own set of challenges and hiccups. The move also came with its joys. 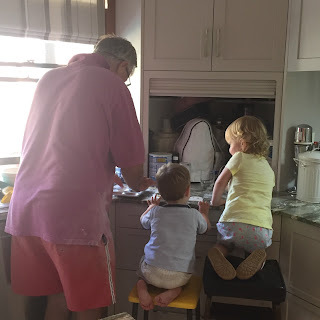 Not only was it immense helpful living with my in-laws, watching the children interact with their Grandparents on a day-to-day basis was a real gem. As a society we've lost that "family all in" way of living that was so common generations ago, and this was a rare opportunity to experience it (not to mention far more efficient than running two households.) And somewhere among the sleepless nights, chaotic breakfasts and general carnage everywhere, I'm pretty sure the Grandparents loved nearly every minute, too. Now it's just the five of us, on our own, unpacked enough to live day-to-day. There's still a lot of work before I can say the move is "complete" but we're thrilled to be finally starting this next phase of our lives. It's been a long time coming. The view out the back aint bad, either.